The first photograph I shared on this site. …I published my first blog post. Seven years! I still remember sitting on my front porch in a rocking chair, typing away on the same laptop and hitting the publish button. And to think I thought it was only going to last a week. Ha! – Most popular day of the week: Wednesday // I’d like to thank All Over Albany for this! – I’ve had readers from 112 different countries! – I’ve installed a plugin that will now show the most popular posts moving forward (because I don’t know how to show it lifetime wise), but I do know for 2017, this has been the most popular post. It was my most favorite too! Much has changed over the last seven years – within this space and my personal life. If you’ve followed along from the beginning, you know I’ve shared A LOT about a wide variety of topics: from being single, food, hiking, running, to meeting the beau, to working hard and setting many goals, reaching some goals and failing at others, going vegan, my ever growing love for essential oils and much, much more. While I don’t write as often as I’d like, I LOVE having a spot to look back on, with photographs, to reflect on. It’s fun seeing where I was x amount of years ago. I go back and forth about keeping the blog / posting with each passing year, especially now because I feel like there are SO MANY blogs out there and many (that I use to read) no longer feel authentic. I get it, sponsorships pay the bills, but I don’t always feel the opinions are real. Anyone else feel that way? At least until the end of the year (when I have to reconsider paying for all of this), I’m going to make more of an effort to share. I saw in my blog feed that one blogger is going to try and write every weekday for the entire month of August, or as she’s calling it, Blogust. I know, I know, we’re already three days into the month but just read about it this morning and am going to give it a go! Filed Under: monthly challenge!, new goal., yet another list. I’ve got a couple of confessions to make. It is way too chilly out there at five o’clock in the morning. It is way too dark out there at five o’clock in the morning. Who likes to keep track, really? I know my excuses are lame- they didn’t seem to be a problem this time last year when I was marathon training; I somehow managed to survive and succeed five days out of the week. And realistically I won’t have the second excuse in about a week after daylight savings. In regards to the third excuse, I honestly find it a chore to keep track of my miles when I’m walking around downtown. My biggest problem is that I forget to stop my timer and hours later, my phone is dead with very little miles and a large time to record. Poo! My solution to this darn challenge that seems impossible, complete actual workouts rather than wandering the streets. And my solution to that daunting task: train for a 5k! Woop woop! The Bust A Move 5k is coming up the first week of April and this race holds a special place in my heart. The first year I ran it, I PR’d. Last year during marathon training, I planned on crushing the previous PR BUUUUUUUUUUUT I then had to have heart surgery and was out of commission. Does anyone else remember that tough day for me? I stood out there, crying as the runners took off, wishing that I was amongst them. Instead of dwelling, I clapped for every single runner that ran the race. I even held on to the winner’s glasses. Good karma? Gosh, I sure do hope so. This will be my first race back in action and I couldn’t be more nervous excited! No expectations other than a good time. I put together a little training plan for myself and a friend, who has never ran a 5k. 100 miles I hope to not see you in April so, here I come! Second confession: I fell off the bandwagon after six days on during the Fab Ab February Challenge. I know, I know. The good news is that Laura and Kathy completed it in full- holler! So, I’m thankful I inspired at least two other women to get active, I just, failed. Ha! Now for March. 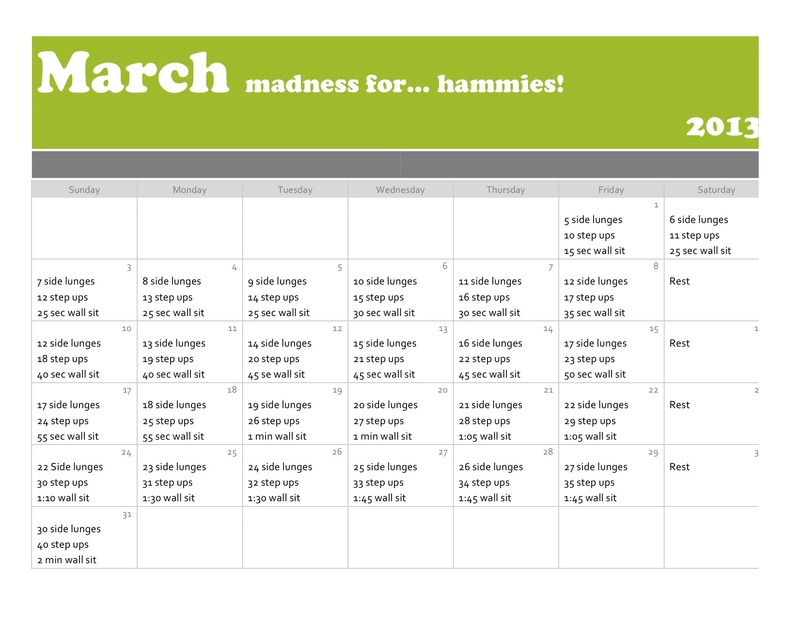 I give you the “MARCH Madness for…hammies!” calendar. You likey? Good. Because I’ve got a good feeling about this one. Three simple exercises: the side lunges, the step ups and the wall sits. If you don’t know what any/all of them are, youtube them, you’ll find how-to videos. Three simple pointers for these exercises: each leg should complete the daily side lunges, the step ups make more of an impact the higher you step and lastly, sit as parallel to floor as you can during the wall sits. You won’t need a partner to hold your ankles this month, ladies. Copy, paste and print. Oh, and join in on the fun! I promise this month I’ll make more of an effort to participate. Filed Under: monthly challenge!, running., yet another list. The reason why it’s in a calendar format is because a) it was easy to make and to follow along and b) it was easy to share with co-workers. You heard me, I’ve got others hooked! There are four of us in my department participating and seven others in another (in the same building). I’m looking forward to checking in with them, and hearing if it is as effective for them as it is me. Copy the image, save it to your computer and join us if you wish! It is so simple and could be done in about five minutes each day. No excuses! I will continue to drink lemon water first thing in the morning. I will continue to do ten squats each time I go to the bathroom at work. 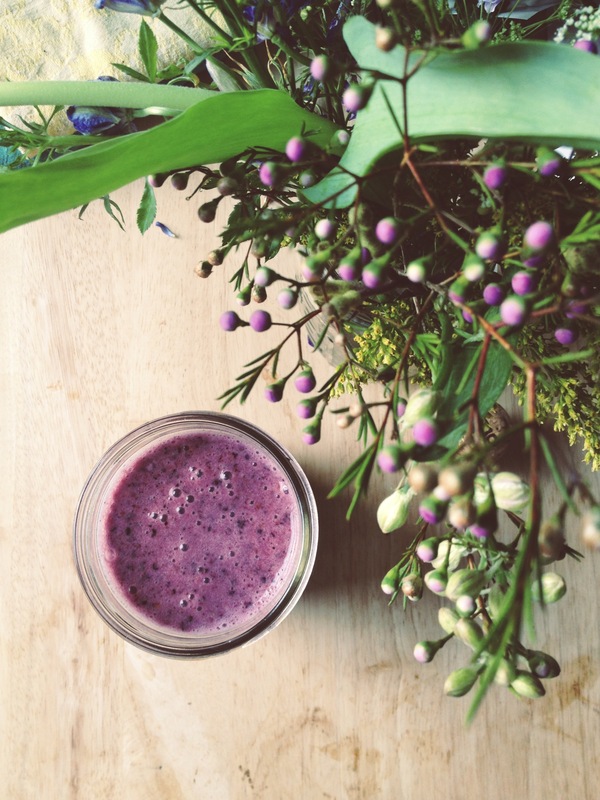 *New* this month I will try to be consistent with taking my morning vitamins. Sometimes I’m in such a rush- it’s just not a habit yet. What are you waiting for?! Challenge yourself this month! Filed Under: monthly challenge!, new goal. That I’d walk/run every single day: just not doable with three jobs. I’d accomplish all the miles outdoors. My hikes would bring in more miles. In reality, it’s winter folks. It’s not only cold out there but it’s also more difficult to hike fifteen plus miles in the snow, during shorter days. I think my hiking partner in crime is excited to hear that I’m continuing this challenge one more month because she knows I’ll try anything new just to get outside. I’m thankful for her because she organizes each hike and gets me moving when I’d prefer to stay in bed. I’m also thankful for a new running/walking buddy that I have that’s a text away on my lunch breaks. It’s difficult to get out there everyday but he’s always encouraging it. The gym at my job is free and there is no reason why I shouldn’t be utilizing that more frequently. Although I hate the treadmill, I just need to hop on, even if it’s for ten minutes, to get me moving halfway through the day. As for my other two small goals, I was successful. I drank a big glass of lemon water almost every single day this month right after waking up. Not only does it kick-start my system, but I think the fresh lemons have helped prevent illness (the beau has had the Frankencold for over a week now). I’ve also done 10 squats with almost each visit to the bathroom at work. This one hasn’t become a habit quite yet, but I’m going to continue both into February as well. There will be a new goal for the month of February that will be announced later tonight.. once I’m done creating a banner (which is difficult without photoshop and without knowing anything about photoshop). Did you set any goals for the month of January? Did you reach them?